I’m about to get maudlin over a vehicle, so if you’d rather have some chuckles today, why not go and check out my very first official blog post, Bad Hotel Karma? I’ll be back to my usual silliness next week. 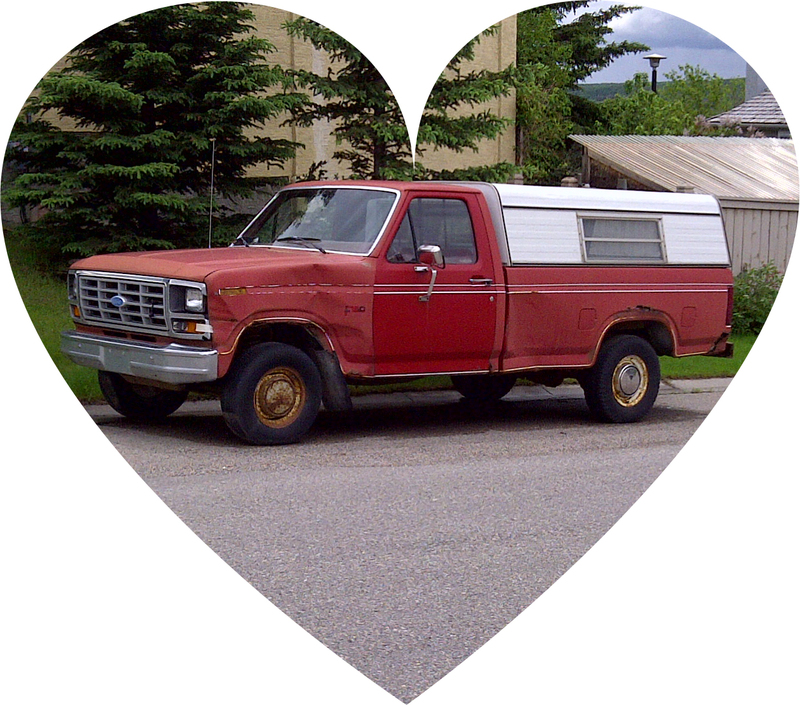 Yesterday I said goodbye to a faithful friend: a battered 1983 Ford half-ton. Even though I’d been its official owner for over ten years, I still called it ‘Dad’s truck’. It’s the truck he drove from Manitoba to Halifax to visit me in 1988. 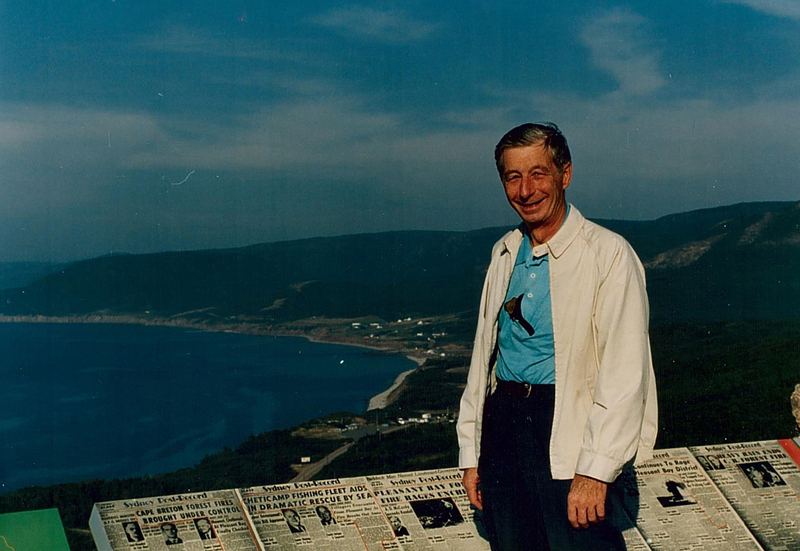 At a miserable time in my life, he drove nearly 10,000 km (6,000 miles) round trip, and we took a long weekend to drive around Cape Breton Island, just him and me. It was a leisurely trip, pulling in to explore every tiny “point of interest” beside the highway and stopping frequently to snap photos. That was before Dad began to suffer from the increasingly debilitating effects of the lung enzyme deficiency that would slowly steal his breath, and eventually his life. I didn’t spare a thought for the truck at the time; it was just a vehicle that took us where we wanted to go. Dad used that truck to haul my piano from Manitoba to my apartment in Calgary in 1989. In 1998, he used it to trailer my 1953 Chevy from Manitoba to Calgary. In 2001, I officially ‘bought’ the truck. The truck came to Calgary in the middle of summer, 800 miles in temperatures hovering around 37 degrees Celsius (98 Fahrenheit). It had no air conditioning, and I was sick with a horrible head cold. We crept across the prairies, stopping in every little town for Popsicles and cold water. The truck performed faultlessly. Me? Not so much. I tried to pay Dad for the truck, several times. At last, I arrived on his doorstep with the cheque already written. And he smiled and said, “Well, I’ve done some deals with the other kids, too, so we’ll just call it even.” The cheque was torn up and the issue was closed. That was my Dad. By then the truck was twenty years old, but it never let me down. It hauled furniture and pre-fab outhouses and garbage and tools. Its capped box served as an impromptu storage shed, and I slept in it many times while camping. Whenever friends needed to haul something, they knew they could come and borrow it. The truck lived a hard life. Parked on the street, its side mirror was smashed by vandals and it got egged and spray-painted. Other drivers ran into it, five different times. Sometimes they slid down our treacherous hill on winter ice and only stopped when they hit the truck. Sometimes they backed into the side of it, apparently unable to see a bright red, twenty-foot long vehicle in their rear-view mirror. But despite their incompetence as drivers, those people restored my faith in humanity. I never found a dent in the truck that wasn’t accounted for. Nobody discounted it as an old junker and drove away without reporting their accident. Each time, our doorbell would ring and some contrite person would apologize profusely for hitting the truck. Each time, I told them not to worry about it. They’d have enough trouble and expense repairing their own vehicle, and they didn’t need the additional cost of an insurance claim. Dad gave me the truck out of the goodness of his heart. The least I could do was pass it on. The truck endured the ravages of age and rust and injury, the years and impacts damaging its body but not its tough engine. It developed a cantankerous carburetor that I referred to as my anti-theft device. To start the truck, you had to open the hood, remove the air cleaner, and manually close the sticky choke plate. Then back into the truck to pump the gas for about 30 seconds, after which you could turn the key while still pumping the gas vigorously. But as long as you followed the protocol it never failed to start, even in the dead of winter. That same cantankerous carburetor required three quick pumps of the gas when starting in first gear. Just a little extra jolt of fuel, or it would stall. The brake drums were out of round, causing a slight surging effect, and the left-turn signal didn’t work unless you knew you had to pull the signal lever slightly outward and toward you. Then it worked just fine. In its stubborn persistence I saw my Dad’s final battle. The loss of breath, the frequent and increasingly serious illnesses, the wasting and weakening of his once-powerful body. Labouring against the burden of slow suffocation, his cardiac arrhythmia was so pronounced that when I took his pulse the irregular beat would have done a calypso band proud. But just like his truck, his indomitable heart wouldn’t quit, and he endured the suffering and indignities with stoicism and quiet humour. In recent years we didn’t use the truck often, but I kept it insured and registered, and it kept doing what we asked of it, over and over. Last spring two young girls in a big half-ton backed into the side of it. Another giant dent; another contrite conversation. Another round of forgiveness with the gentle admonition to drive more carefully in the future. Just the way my Dad would have done it. I could have called the insurance company then and let them write it off; maybe gotten a couple of hundred bucks. Instead I hung onto the truck, not driving it but keeping it registered and insured and in its place of honour beside our house. A couple of weeks ago I drove it for the first time since the girls in the half-ton hit it. It started right up as usual, but its shocks were gone. It wallowed through undulations in the pavement like a ship in heavy seas, and its steering wandered dangerously. I wanted to cling to it from sheer sentimentality, but I couldn’t bear to see my poor truck endure more dents, more infirmities. It was too much like watching Dad face a battle he knew he couldn’t win, bravely waiting for the final blow. In the end, Dad’s every breath was an agonizing struggle. Coughing literally tore him apart, causing a massive hernia. The morning after he underwent surgery to repair it, the surgeon told us he could go home that day. Mercifully, he did go home later that day, but not to any earthly dwelling. It was April 1, 2004. April Fool’s Day. Go figure. I knew the truck’s time was up, too. It wasn’t safe to drive and it wasn’t practical to fix, and I didn’t want to wait for the day when its heroic old engine finally failed. So I called Donate A Car Canada and yesterday my beloved truck went away for the last time. The Lung Association won’t get much for it, but I’d like to think Dad would be pleased. Today there’s an empty spot on our street, and in my heart. Lovely, Diane. I am speechless. This is the best thing I’ve read in a long time, Diane. Please submit it to an essay contest or magazine. Your father sounds like a wonderful man, but did you park that truck in a intersection? He was… and you’d think I’d parked in an intersection, considering how many times the truck got hit. It was neatly and legally tucked away at the curb in the middle of a block, but the street slopes downward on a curve. Apparently it’s entirely too much of a challenge for our local drivers to navigate. I read your story and it brought back many fond memories of your Dad and for many others who knew him, I’m sure. He truly was an amazing man. Enjoying all those evenings that we shared with him, playing cards and sharing many stories. It was well written tribute to your Dad, and we do remember the truck ! Good work. Beautiful, Diane. This is one of the best posts. Great memories, and I’m sure your dad, and his truck, are smiling at your words. Thank you for that Diane…I am your former neighbour from down the road a quarter of a mile when you and I were children – Leslie . I do not remember the truck so much as I remember your dad. He was the man that gave the toast to the bride at my wedding and who also was one of the best friends my dad ever had. Because I knew your father all my life, I can say that all the qualities you say about him in your writing are absolutely true. My dad travelled with him shortly after your mother and mine passed away. I can well imagine that a lot of the time they discussed their *vehicles*. Your writing did bring tears to my eyes because of memories long forgotten. My dad is almost 93 now and I will certainly share this with him. Again thanks. I’m so pleased to hear that your dad is still with you – I never knew him well but I know how much Dad valued his friendship and their travels together, so he must be a very special person, too. That was so nice…brought tears to my eyes but warmth in my heart ! Thanks for the walk down memory lane and the tribute to Dad. There will be an empty spot beside your house the next time I come to visit. Take care! That was beautiful Diane. What great memories of your Dad and the truck. Bless him and bless you for sharing. Thank you. I don’t do “serious” very often, but this felt like the time. Very nice and heart-rendering, Diane. Three tales (for want of a better word…) in one, of your Dad, the truck and your relationship with both. Nicely written. A very, very touching tribute. It stirred memories of my time with my own dad (RIP) and the many Saturdays we spent working on the cars in the garage together. A lot of bonding goes on in cars, and a man who would would drive 6,000 miles to hold you in a miserable time in your life is certainly a man I would have been proud to meet. Diane your post leaves me with a lump in my throat. Your talents as a writer are so broad. I feel as though I have met your Dad through your eloquent words. A wonderful tribute to him and the faithful truck you and he shared. Hugs to you. Thanks, Sue. I had a lump in my throat, too. Still do, a bit. Understandable. Take good care of you. All the very best. This is beautiful and sad and uplifting. You had a great dad. Going sideways with my kids was fun. They’re 38 and 36 now, and it’s STILL fun. Just ask ’em. That was a brand new 1966 Vette. My bad. What a wonderful but heartbreaking story. I can understand why you wouldn’t want to part with it. Sorry to hear your dad had to suffer so. I’m sure he’d be proud of how you nurtured his vehicle, not to mention how proud he’d be of all you’ve accomplished this past decade since his passing. Thanks, Carrie – I hope he would be proud. It was a gift to have his quiet integrity to use as an yardstick for my own behaviour. Beautifully written Diane. A great tribute to both the truck and your Dad. He was obviously a very stand up guy. Good job!